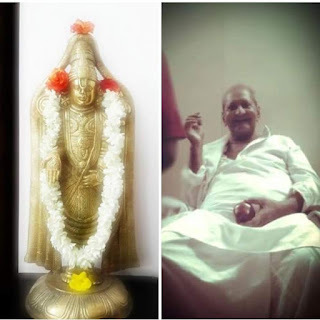 Nannagaru which in Telugu means Revered father is an epitome of Love, light, compassion & solace to seekers of all kinds. He was realized through Extreme love for Bhagavan Ramana at a very young age., From whence people started flocking to him in huge numbers. Not only truth seekers but people of all categories came to him. Few for financial help,few for health issues,marriage issues,kids issues,job issues & every other issues. He would receive all of them with the same warmth & compassion & guide them in a way that everyone went home with hope & contentment. He was a pillar of support to thousands of families & was more like a God father guiding them smoothly through life’s difficulties. When it came to spirituality, he was a class of his own. 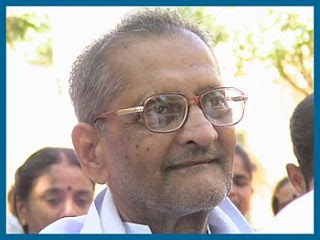 He would capture the hearts of all Devotees with grace & divinity. Many experienced glimpses of enlightenment in his presence. Always clad in pure white clothes & ordinary footwear, he traveled far & wide spreading the light & teachings of Bhagavan in a way that even layman & illiterates understood his message. Unlike many modern saints & sages he never had any restrictions or Privacy. He was available to all at all times.He served society in a way that is unimaginable to people of present times. As Jesus said ’Let not the left hand know what the right hand has served’, he spent every penny of what he received to uplift humanity from need & suffering. His goal was to bring humanity out of suffering. There were many instances where he literally absorbed the sorrow of people in pain & loss. His very look would calm many hungry souls & his words healed their hearts. His teachings were extraordinary & holistic. There was not a topic he hasn’t covered nor left any path unattended. He gave importance to all faiths & all religions & guided them all within to attain the oneness which is the essence of all religions! 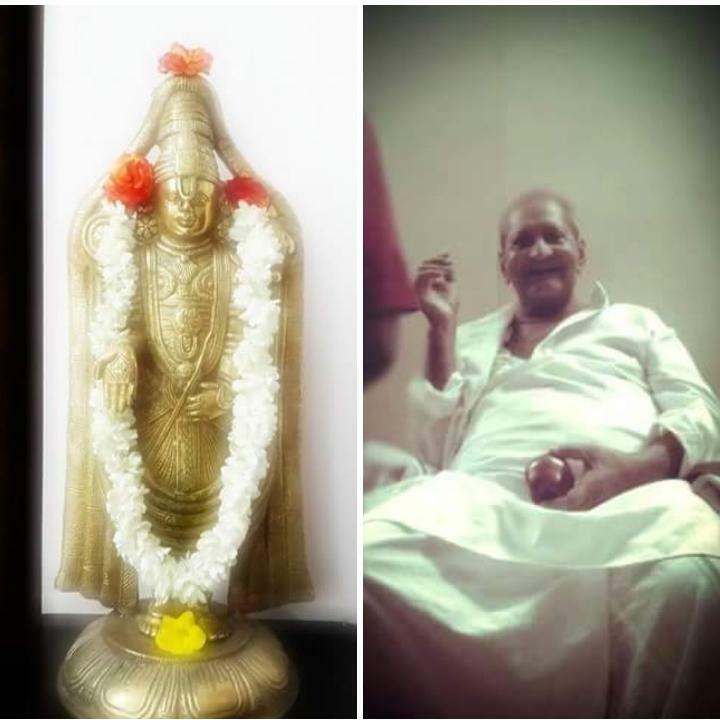 In a nutshell Nannagaru was the guiding light in the form of Loving father,mother,friend., closest relative & Guru who guided Devotees to an inner life with ease, washing out all troubles to each one of them making their effort effortless & filled their hearts with peace eternal! A father brought his son to Sri Nannagaru. He complained that his son didnot want to marry and wanted to give up his abroad job so that he can spend his full time in meditation. "Donot differentiate between the material life and the spiritual life. Even the materialistic work must be considered as spiritual work. In the Vishnu sahasranama (the 1000 names of Lord Vishnu), there is there is a name called Vishwam meaning the Universe ie the Lord implied that: 'the one who exists in the very form of Universe is Me only'. In the Gita, the Lord said:' One can attain Self Knowledge only through the effort of several births.' Buddha said: " I have attained the state of Nirvana today only due to the endless good deeds done in my previous births." Therefore Jnana (Knowledge) and Karma(Work) represent the two wings of a bird. A bird needs both the wings to fly. Similarly we must utilize both the aspects of Jnana and Karma and attain liberation. Most of the people who want to give up their jobs for the sake of spiritual evolution turn out to be escapists. They gain neither materially nor spiritually. Therefore you must not give up your work for atleast 20 more years." 1) Donot give up your job for the next 20 years. That country is a very peaceful and rich nation. Therefore stay in that country only and save your money. Do some charity but not to the ineligible people. When I advised an American resident to purchase lands, he replied: " Since whatever we possess is all white money, we have to guard the lands that we purhcase in America. Therefore I bought lands in India only." Therefore plan your savings accordingly. 2) It is better to marry than to burn. However as you have made God as your goal, you can give up marriage if you are not willing. 3)Always read the books of those people who have the energy to bestow their Grace. I will give you the book 'The Gospel of Sri Ramakrishna'. In that book, the answers of Sri Ramakrishna have been marked in red. Read that book atleast for half an hour or an hour before you sleep. If you read the book 'The Gospel of Sri Ramakrishna', you will get the required foundation for leading a spiritual life. Your craving to enjoy the world will automatically get reduced. 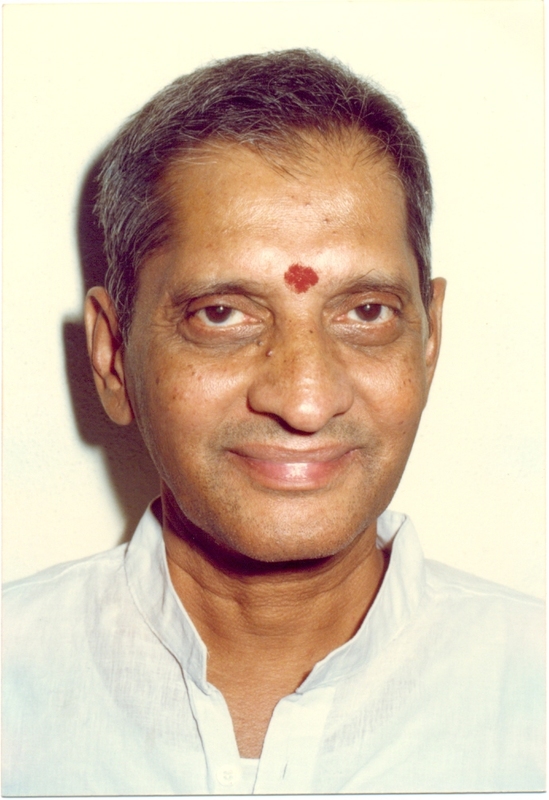 You can also read the books of Bhagavan Ramana like 'Who am I?' or 'Talks with Ramana Maharishi' or 'Be as you are'. 4) Buddha said: " Dont consider that some other person has committed a mistake and that you will not do the same. If you are careless, even you can do the same mistake." 5) Sri Ramakrishna said: " You are now saying 'i', 'i'. Realizing that you are not that which you are referring to (ie body and mind) is only Self Knowledge." 6) There are two main causes for rebirth: filthy tendencies and filthy deeds. If you are able to eliminate them even before the death of your body, you will not get another body. You need to have an opposition party to eliminate them. Holy Company is very useful for this purpose. Japa and meditation are for the purpose of concentration and introversion of mind. In the Gita, the Lord said: " Rather than giving up the work in entirety, the one who works and offers the fruit of his action to the society will reach Me soon. It is better to sacrifice the fruits of your actions than sacrificing your actions." 8) First do Japa very well. It is Japa which leads you towards Dhyana(Meditation). Meditation is not something to be done. It has to happen automatically for which you will require a background.Not that you should not meditate. You can meditate in fixed timings either in the morning or in the evening. 9) You must harmonize all the four yogas ie Karma, Bhakti, Dhyana and Jnana and attain spiritual evolution. Going forward by Harmonizing all the four paths is the safest path. You will not be aware of your weaknesses until and unless you donot start working. 10) Don't hate others inspite of being hated by them.Forgetting is very difficult. Everything will be ended if you can forget. Forgetting is much more difficult than Japa and Meditation. 11) If you identify yourselves with the Truth, you will view both the men and women as Truth only. You must attain such a standard and level of Consciousness. Spirituality implies fighting with yourself. 12) Beware of your friendships. One boy told me that he got reformed due to the company of an intelligent friend. (Sri Nannagaru said that the boy will get Noble prize in future). 13) Visit Arunachala. You can recharge your battery.Keep watching our website. It contains our teaching. 14) Donot give up your work. Work will elevate and purify you. It is only while working you will come to know of your positive and negative attributes. They are not known in meditation. Only after knowing them, you make an effort to eliminate them. Only when you become aware of the disease, you make an effort to get it cured. 15) Donot neglect your materialistic work. Whatever small thing you may do for the benefit of this world, God will certainly become happy with it. 16) This world is like a training ground for us. It resembles a mirror. It points out the faults within us but doesnot eradicate them. We have to get rid of them on our own. 17) Milton said in 'The Paradise Lost': "Desire and anger are better when compared to craving for fame. Desire and anger subside as and when our age advances. But it is not the same with regard to craving for fame. Therefore donot crave for fame. 18) This is the dark age. You may come across different types of people. Some people may deceive you.Though some people are aware of the subject, they may not lead their life according to it and thereby become sorrowful. Therefore currently we cannot trust anyone.Donot get deceived and thereby become a fool in the name of spiritual life. 19) God looks at the intention behind your deed and not at your deed. Even if you are compelled to do some thing against your conscience as part of your official duty, you need not regret as God is more concerned about your heart behind the deed and not the deed itself. 20) Keep working slowly and steadily without forgetting the destination. At some point of time, you will get divine interference. Your Heart will get deepened. You must not have expectation. It will come automatically. If whatever can be done from our end represents 5 paise, whatever has to come from God's end in the form of Grace represents the remnant 95 paise. As you possess mind, you cannot stop making an effort. Do something or the other ie either japa or meditation or work or self enquiry or discrimination. 21)One attraction is sufficient to ruin us. One single attraction can lead us into several births. Though you dont want to get another body, you will get it as long as there are tendencies within you. How long can you stop yourselves when you feel like vomiting? Therefore God's Grace is required to get rid of the tendencies.